Monday afternoon I had some homework to catch up on, so I went to a coffee shop to sit and sketch. This design was loosely inspired by the Rococo period, when fashionable ladies wore giant hip pads called panniers underneath gowns. I loosely based the skirt shape on the idea, instead using panels of a mediumweight silk or wool over a full underskirt. I actually started with the jacket, styled after the riding jackets and caraco jackets of the late 18th century that usually had a fancy peplum or lacy "tail" in the back. 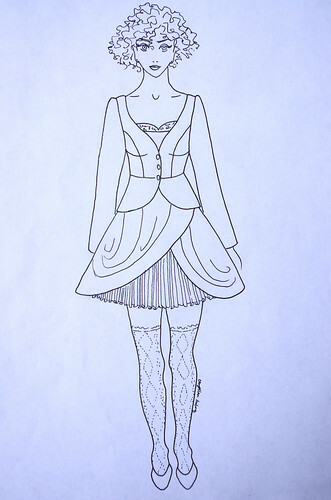 Then I added in some knitted lace stockings, since silk knitted stockings were a luxury of the time. 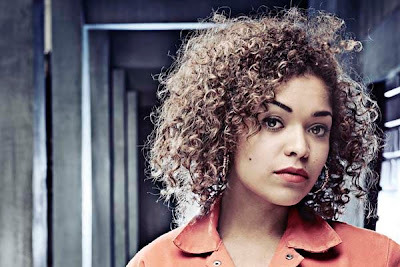 As I was drawing, I realized I had another pretty clear inspiration: Alisha from the UK television series Misfits. (Basic premise: a bunch of kids performing community service for various crimes are hit by a freak storm and get super powers.) She's a babe, and she knows it. She has gorgeous curly hair and rocks big hoops, pinup makeup and a bad attitude even in her orange jumpsuit. Lumberjack and I have been watching the show lately, and I love the cinematography and the character styling. I also used some new pens for this drawing, Pigma Microns, and I'm in love. I used the 03 size for the outlines and the 01 size for the face and details, and I really like how much control and depth the different sizes add. I've really liked working in pencil, but I'm often disappointed when I get to the inking because my favorite small-gauge Copic lining marker died and I couldn't get things as detailed as I wanted. Plus, you can use watercolors with Pigmas since their ink is not water soluble. Now, to ink all 15 of my previous drawings for history... that'll be a project! I am a huge freaking yarn snob, that's why. I was trying to teach myself with scraps of kitchen cotton in my leftover stash and kept on getting frustrated with how splitty and uneven my stitches were and how uncooperative my fingers were being. And then I grabbed a little extra ball of Madelinetosh Vintage left over from a little scarflette I knit a while back, and suddenly everything just clicked. It's an interesting experience to go from a craft where I feel very comfortable doing more advanced techniques to a craft where I am apparently made of thumbs. I see the little tricks that should make things tidier and I get frustrated easily because I'm thinking beyond my actual skills. In the end it really doesn't matter that you can do a slipknot-free crochet cast-on if you can't hook an even chain to save your life. This little motif was for practice, and I'm reasonably happy with how it turned out - although I have to say, it's pretty much the yarn's fault that it turned out at all. I read the instructions wrong and ended up with twice as many outer petals as I was supposed to, but I actually kind of like it. I'm definitely going to try blocking it and seeing what happens. And then, to what purpose? 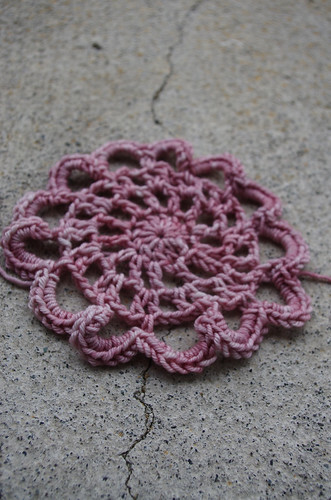 Doily? Wall hanging? Maybe I'll frame it and put it on the wall as an example of my first non-crappy crochet. 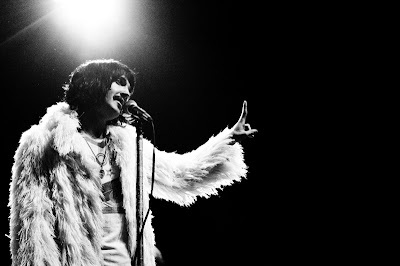 Lead singer of Foxy Shazam, Eric Sean Nally. Lumberjack, my brother, my friend Derek, and I went to see a show by The Darkness this last Saturday. A glam-rock band from Cincinnati called Foxy Shazam opened - and absolutely stole the show. The lead singer was all over the place: dancing frenetically, throwing his mike around the stage, collapsing to the ground and getting up again the space of three or four seconds - not to mention that his voice sounds like a close cousin of Freddy Mercury's. The other band members got in on the fun, too: at one point, the keyboardist went crowdsurfing - with his keyboard. And at the end of their set, the lead singer smoked three lit cigarettes, took a ride around the stage on his bassist's shoulders, and then ate the cigarettes whole. Their showmanship and musicality seemed to epitomize the greatest of glam-rock, with tight pants, dramatic hair, sequined vests, and thrilling, spectacular, unstoppable energy. From the second they walked on stage, you couldn't look away from them. I loved the in-your-face style and badassery of the whole show, and I absolutely adore the fact that these guys stomp around the stage bursting with a potent male sexuality while wearing sequins, scarves, and eyeliner. Screwing around with gender norms seems to be one of the major hallmarks of glam-rock and hair metal, and I like it. 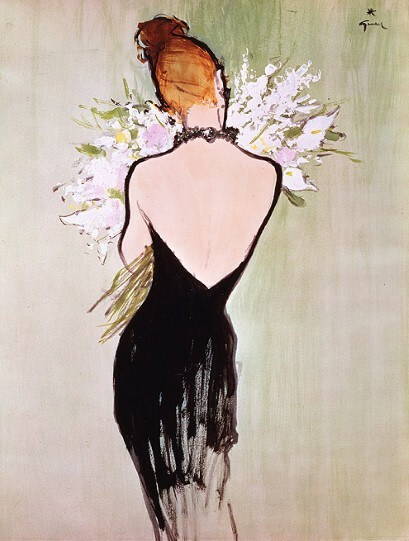 Dior's New Look, as illustrated by Gruau. On a totally different note, I've also been pretty immersed in fashion history books. I have a big stack of huge books on Art Deco fashion, '40s and '50s couture, Yves Saint Laurent, and different types of lace from history. It's been fascinating to look at early 20th century fashion, because fashion illustrations played an integral role in both portraying fashion and creating the sense of glamour associated with couture and early ready-to-wear designs. It's also interesting to see how the popular body type and facial shape change over the years: in the 1910s-1920s, it was all about long lines, thin eyebrows, and round faces, where towards the 1940s the trim, but slightly shapely figure was popular - with very little yardage used due to rationing - and then finally in 1947 Dior introduced the New Look, with the tiny waist and the full skirt as a sign of the decadent post-war period. Even though I'm not the biggest fan of world politics in the late '40s and early '50s, they are definitely my favorite decades for fashion. So many shapes and silhouettes of that time period are still such classics that I'd say it's as close to timeless as fashion will ever get: the little black dress, the fit-and-flare dress, little tailored suits, and perfectly fitted trenchcoats. Sigh. 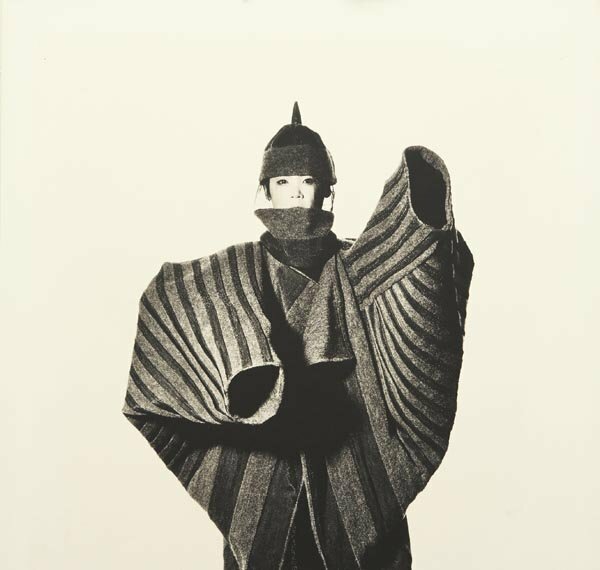 Coat inspired by an onion flower head, by Issey Miyake. As you may be able to tell, I'm a little all over the place. One of the other books I got at the library was a retrospective of Issey Miyake's work, particularly from the '80s. The clothes are as much pieces of art as fabric: he plays with pleats, volume, material, and shape in such an innovative way that has clearly influenced the current generation of designers. This coat and hood set in particular was my favorite from the book; it's a knit coat made from wool and nylon mesh, and I love the interplay of textures and the strange yet organic shape. It makes me think of Setsuko Torii's knitwear designs, with her use of metal-blended yarns that give fabrics a new dimension. I like that it's a different way of thinking of fashion: clothing not simply as body coverings, but not so isolated from the body as two-dimensional art, either. At times it seems like these pieces don't belong on the body, yet without a body in them they would lose their internal structure. I also love that there's a different context for his designs than the typical Western fashion fare: in the book, you can see echoes of the breastplates of samurai armor, kimono and hakama (Japanese-style trousers), shibori and indigo-dyed textiles. Overall, there aren't necessarily any connecting threads in these three modes of style, but I find them all equally compelling. With so much information coming in all the time from school, books, and events, it's a little overwhelming, but it's nice to single out a few and find some focus. Maybe someday my spongey brain will figure out what these things have in common and give it a name. I needed a new brainless project to knit while carpooling and in lecture class, so I cast on for my third Hat Challenge project. Yay! 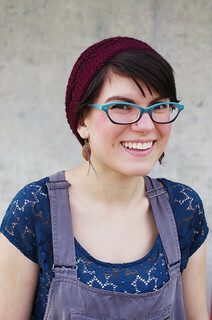 This is the Sockhead Hat by Kelly McClure, and it's a super cute little slouchy hat that can be knit in a variety of different yarns. Pashmina is just barely a sportweight, so it's a little heavy, but the fabric it's making is very squishy and nice. 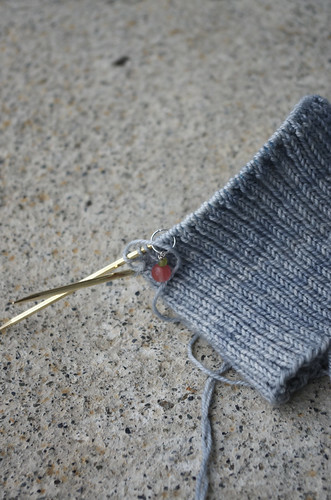 It's funny, when I bought this yarn, I thought it was a silvery grey, but now that I'm knitting with it, it's abundantly clear that it's a very, very, very pale blue - especially when it's put up next to true greys. I was actually bad with this hat, and didn't swatch. Well, that's not strictly true: I did try to swatch. I started with a US 2.5 (3.0 mm) and after about two inches of fabric, I was getting about 7 stitches per inch instead of the suggested 8. So I ripped that out and switched to a US 2 (2.75 mm), thinking that should definitely fix it. Nope. I got 7.5 stitches per inch, and my hands hurt from knitting that teeny gauge with biggish yarn. So I said screw it and cast on without getting gauge. 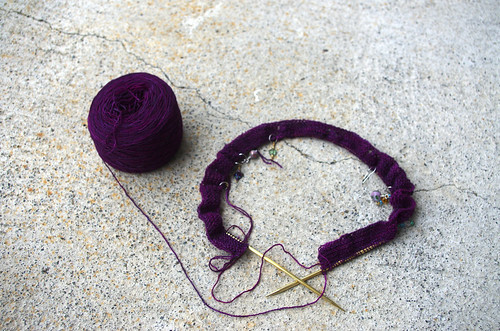 I'm using the smaller needles for the ribbing, since I invariably wish the ribbing of all my hats were smaller. 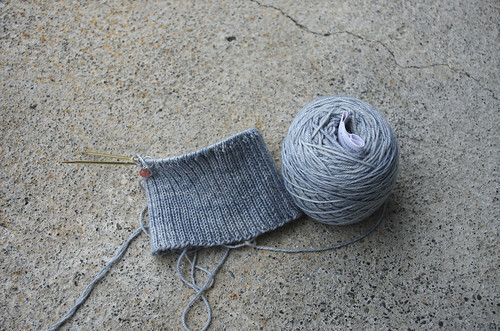 I think I'm going to switch to the larger needles for the stockinette portion. It's been a great project to throw in my purse - it's so much easier to finish in the middle of a round of 2x2 ribbed hat than in the middle of a lace row! I don't even remember how long I've had this scarf in the works... 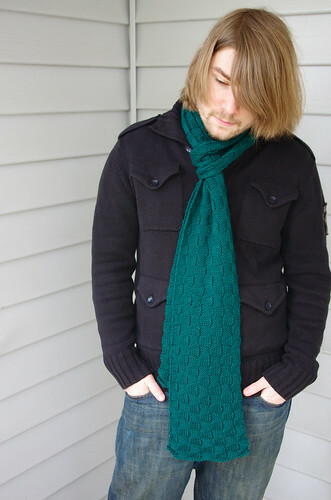 I guess not too long, maybe a month, but scarves always feel like they take forever to knit. I swear, even if I knit a scarf in two days I would emerge from the experience gasping and clenching my Addi Turbos, muttering about ten long years in the desert of Superwash Merino. You'd think there would be some sort of ceremony or closure to the event, but usually I just cast off and think "hmph, that was boring and tedious, oh well, now I can block it, whee!" 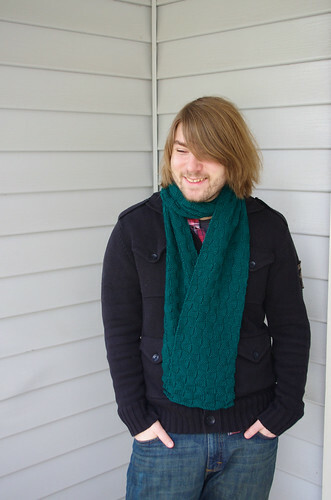 I knit this one out of Cascade 220 superwash from Deep Stash for my friend Derek (the story is here) and used two full skeins. I just kept on knitting it forever and ever, until I had about a yard of yarn left and figured I should bind off. And man, this sucker is long. Probably a good 7 feet long, which I can't measure because my measuring tape doesn't go that high. 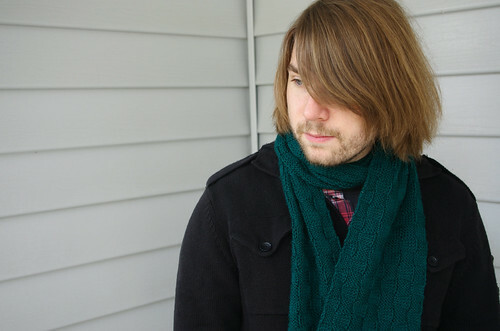 Luckily, I seem to remember somewhere in my yarn-addled brain that Derek likes his scarves long. Yeah - I planned that. 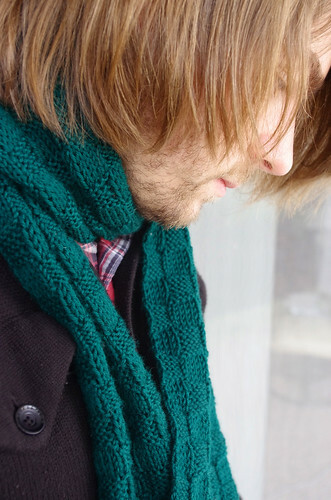 I also got lucky with the timing of this project (and/or have fabulous time management skills, depending on how self-impressed I'm being): the scarf dried with just enough time to photograph it before handing it off to Derek this weekend. Needles: Size 8 (5.0 mm) US Addi Turbos - the regular kind! Yardage: all 440 yards, yeah! Mods: I didn't knit the number of repeats I specified in the pattern, I just knit until my yarn was gone. I also used a smaller needle, because no matter what the knitting powers that be tell me, Cascade 220 is DK-weight in a worsted-weight sheep's clothing. Sunday was an epic, epic day for laundry, and I finally got around to washing some thrifted stuff. 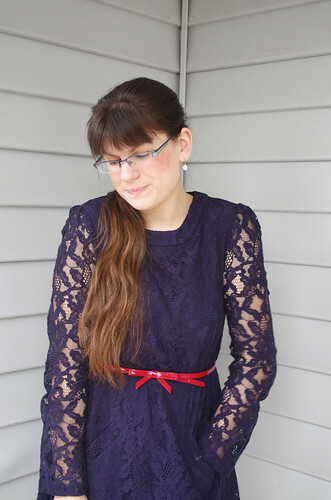 This dress was from the Magical Mystery Thrifting Trip from a few weeks ago. 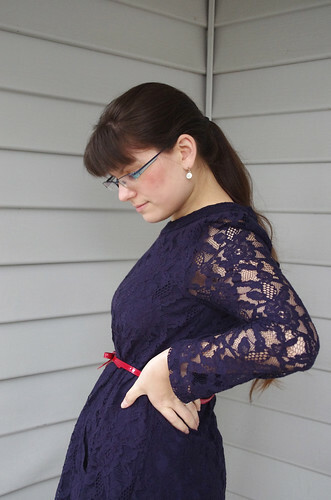 I've been drooling over lacy little dresses on Modcloth since last summer, but since my budget has been a bit tight, I opted not to buy one for full price. Which, in the end, was a pretty good idea, because this dress was about 20 bucks, in perfect condition, and exactly the sort of thing I was looking for. There isn't really any shaping to the body save for a gentle A-line, so I used my little red bow belt to cinch it in. It's been cold and rainy, but I wanted to add a little kick to my week so I wore some tights and knee-high boots for warmth. It's not the best color on me, but I still love it. It has just a touch of '60s sensibility without being too literal, and it's very comfortable despite looking pretty sharp. Saturday was a crazy day - first I went to work for a little bit for the new internship, then got home around 2 pm, and then my mom, my dad and I went to Madrona Fiber Arts out in Tacoma... then later, Lumberjack and I went out to dinner at a restaurant called Local 360 (delicious, locally sourced Americana and comfort food) and then to a Bombay Bicycle Club show at the Croc (a bar/venue in downtown Seattle), which was one of the best concerts I've ever attended. Back to the yarn, though! I had heard about Madrona about a zillion times through reading blogs, but since I was always in Ohio this time of year, this was the first year I've ever gone. I didn't take any classes, but my mom and I did go to the marketplace, where I was (mostly) good and got two patterns, a bunch of 16" Addi Turbo Lace needles so that I can make hats without wanting to tear my hair out, and these three skeins of yarn. For a fiber festival, this is a pretty small amount of yarn for me, but I'm trying to remain at least a little committed to stash dieting. Hahah. 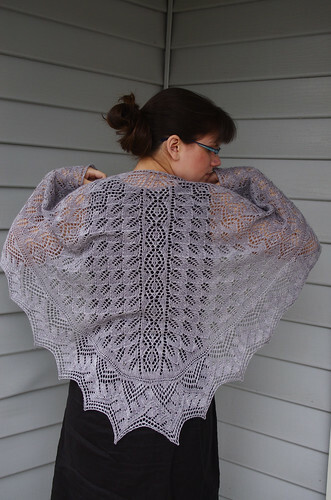 This skein is Pashmara Lace by Fly Designs. My mom bought two skeins of this same yarn in an electric violet colorway when we were at Sock Summit, and I just love how bright this blue is. 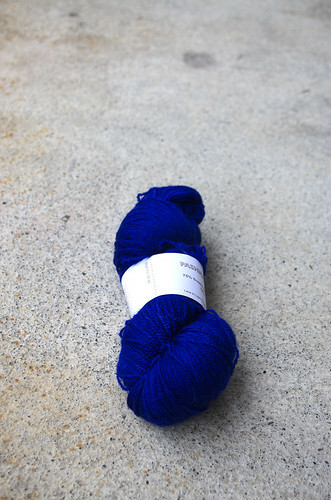 The colorway is Cobalt, and it really is a true cobalt blue. 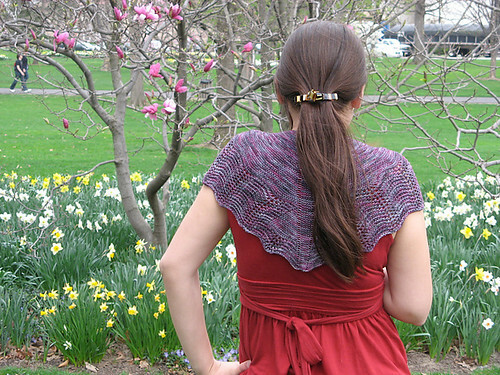 I'm planning to make Romi Hill's Maia Shoulderette, from the 7 Small Shawls Collection, out of it. Then there's this yarn, Tactile Fiber Arts Arcata Lace. 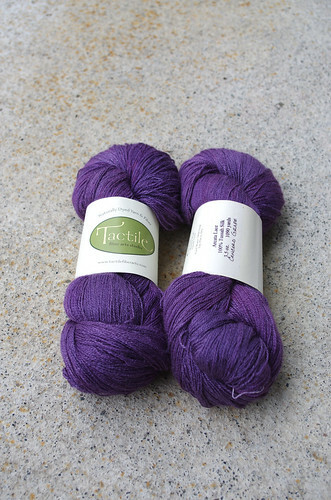 I'm working on a gift project out of this same colorway, Concord Grape, in a different yarn base, and I love the color. I've been on a major Tactile kick lately - seems like I'm drawn to every base of her Pomegranate and Concord Grape colors. 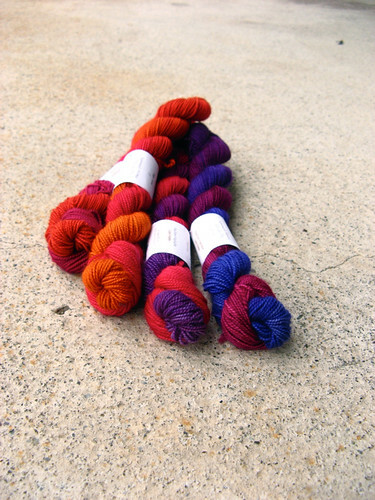 It's like Madelinetosh and her colorway Tart, which I have or have used in four different bases. Overall, I was really impressed with Madrona. It seemed like a more relaxed version of Sock Summit - 2 hours seemed like plenty of time to take a look at all the booths in the market, whereas I still could have seen more at Sock Summit after walking around for more than 5 hours over three days! I'd also be interested to sign up for classes in the future, since they have some amazing teachers and designers who come in. Plus, there is nothing quite like standing at the top of an atrium looking down on over thirty people knitting at the same time. That alone was worth the trip. ...and then left it in my basket, intending to weave in the ends and put them in my sock drawer, for, oh, just about a year. So I was looking for something in my studio on Sunday and happened upon these socks: perfectly good, repairs all done, and really, all that was left was weaving in the ends? So I took in into the other room and wove in the stupid ends. The repair job is about halfway down the sock, on the right side of the foot, and I'm impressed how little it shows. Good job, Me of a Year Ago! It's such a pretty sock (the pattern is Cookie A's Hedera), and I remember that the yarn, Ella Rae Lace Merino, was fun to work with. It's so nice when brand new socks magically appear in my sock drawer with so little effort, even if the process by which they got there could have been shortened, if only I were less scatterbrained. 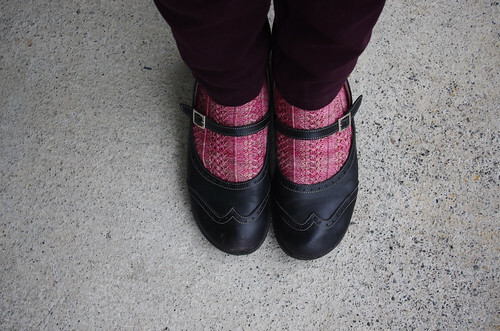 A bonus of these freshly wearable socks: they're pink, which means I love them deeply. Harbour Lights, she is blocked and woven in. Stick a fork in 'er. 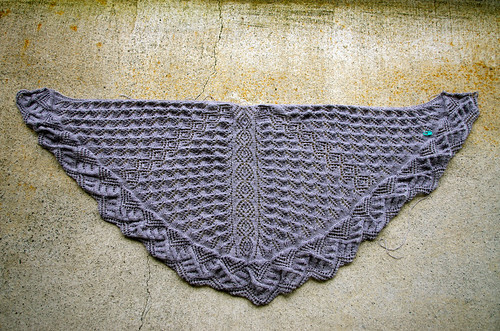 I was initially a little worried how the cast-on and bind-off edges of the edging would look, especially after blocking. Verdict? They're not perfect, but they'll do. 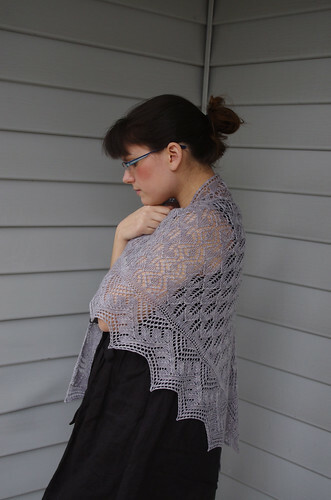 Overall, I think this shawl will definitely get some wear as a late-spring to early-summer shawl - the beads add heft, but they also add a chill factor! All those tiny little beads have a much lower heat capacity than the cashmere/silk blend yarn, which means they soak up cold and transfer it to your skin. Which may be nice in the warmer months, but isn't going to do me much good in the cold weather we've been having! On another note, I read a blog post recently by a knitter who doesn't have a stash. (GASP.) I can definitely see how it would simplify one's life. Some days I aspire to be the kind of person who doesn't need a stash. There's something very appealing about finishing a project and going to the yarn shop to buy more yarn for the next project, never accumulating huge quantities of yarn that jump out to attack you when you stumble into your stash room at 2 am to look for a fix of aran merino. 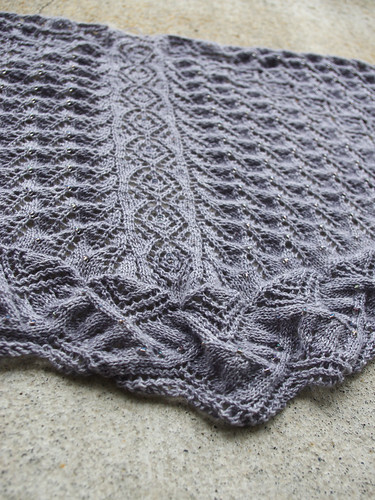 But other days, I realize that projects like this one - made from a stash yarn that needed a few years of percolating to know what it wanted to be when it grew up - are part of the life cycle of the stash-laden knitter. Maybe it's blatant rationalization, but I think having a monstrous stash challenges me to find the perfect pattern for each yarn, even if it sometimes takes a while. I do have trouble knitting certain yarns in my stash, because I bought them when I was a much younger and more fearful knitter. I bought them knowing there was a possibility I'd never be skilled enough to work with them properly, and thus they have never left that yarn-pedestal in my mind. Of course, at some point I have to realize the ridiculousness of this idea and just knit the stuff up. As my friend Teri says, there will always be new, pretty yarn to buy and put in your stash. I think I'll trust her on this one. 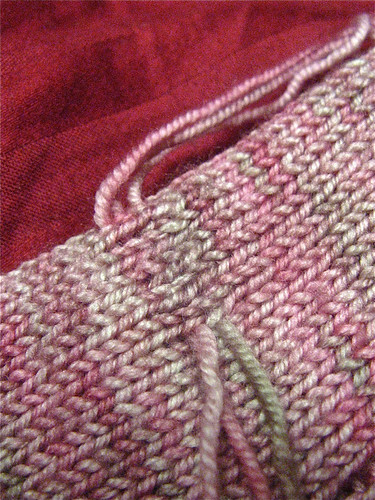 Notes: I used the knitted cast-on for the edging and cast off knitwise. Other than that, I knit it exactly as written. Yesterday I went to school for the first time this week, as Monday and Tuesday were spent napping hard to fight off a cold. I was still feeling sick Wednesday morning, but still a million times better than earlier in the week. Let it be stated for the record, however, that photo shoots while sick are a difficult thing, because in every other shot, I am making the same glazed-over "why am I not napping right now" face. 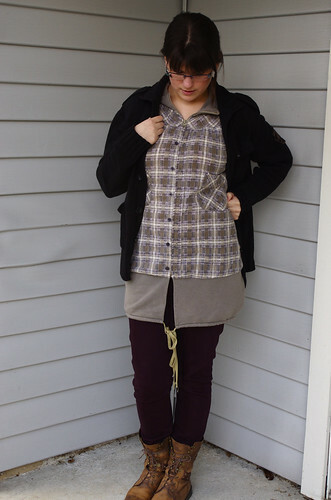 As part of my general attempts to dress nicer than a t-shirt and jeans, I threw on these dark purple skinny jeans, a blouse, and this vest made from a flannel shirt that I bought when I was probably fifteen. I think it was $90, which seemed such an absurd amount of money to me at the time, but I coveted it, so I bought it. It's now been in my closet for almost a decade, so I'd say that it has good staying power. 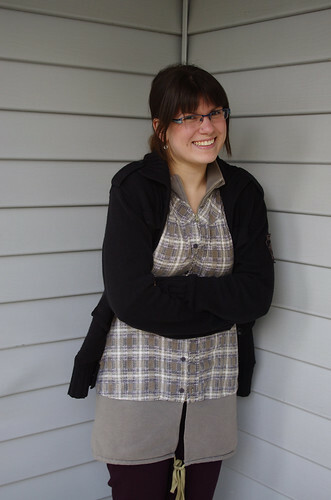 I stole Lumberjack's military-style knit cardigan, laced up my combat boots, and snuffled my way through class. I cut out the pieces of a camp shirt from muslin that inexplicably had a little piece of dirt (worm carcass? mothwing? let's call it dirt.) woven into the actual fabric. Gross. I managed to cut around it, though, and returned home triumphant to eat a sandwich and take another nap. Betcha weren't expecting that ending. I woke up on Sunday morning with a cold, so I've spent quite of bit of time sitting around in my pajamas for the last couple of days. Not as much knitting has happened as I'd like, but I did cast on for a new project on Sunday night. The pattern is A Harebell Fichu from Victorian Lace Today. My mom heard me talking in awe about the book one day over the phone during my freshman year at Oberlin, and two weeks later I got a copy in the mail. I immediately blew off my homework and took it to the library to read it cover to cover. I actually haven't knit anything from the book yet, but it's remained one of those "someday when I'm good enough I'll totally knit tons of stuff from this" books. Now that I am good enough, it's about time that I tried some of the patterns out. I ended up ripping out everything but the cast-on the same night I cast on, but I started over Monday and have done a little bit more since then. Originally the pattern had me knitting picots at each end, but I didn't like how sloppy mine looked - that, and I totally misread the pattern and had to rip back anyway. This particular project is yet another one inspired by my friend Ondrea, who cast on for her own probably two years ago now. I'm not sure if she ever got to finish it - the pattern is a little muddy in places - but when I saw she was working on it, I got this idea stuck in my head that I wanted to make it. 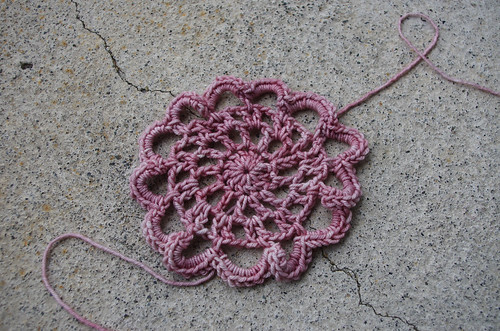 When I was out in California visiting friends a few years ago, I bought some yarn with this pattern in mind. 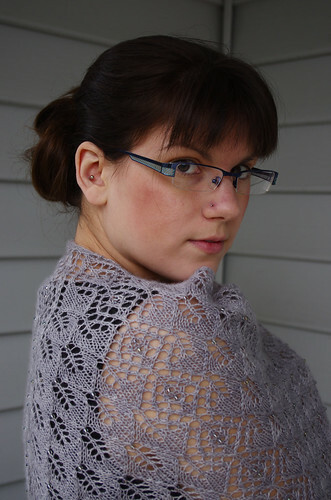 The fichu, sort of like a little mini lace capelet, is a little old-fashioned, but then again, so are shawls - and I love wearing shawls! I have no idea how I'll wear this sort of thing, but I'll be sure to report what I come up with. 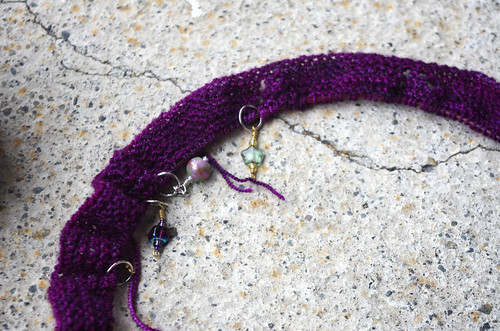 The yarn is Curious Creek Meru in the colorway Plum Thunder. 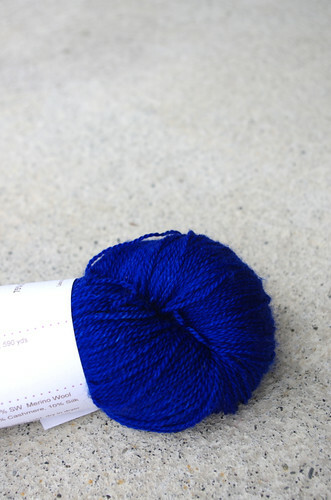 It's a two-ply merino/tussah silk blend with a lovely hand - slightly crunchy, but soft. The color is a saturated plum, just the kind of color I like to have next to my face. I'm knitting it on size 3 (3.25 mm) US needles and I like the fabric so far. I'm hoping that this will be a fun, fast little project - I've had it on my knitterly radar for so long that I'm anxious to see how it turns out. On Saturday night, my mom and I went to a show by Les Ballets Trockadero de Monte Carlo - a drag ballet corps, which was awesome - and then I came home and rocked out the last 5 repeats or so of Harbour Lights. And now it's done: 21" deep at the spine and heavy from beads. My main reason for finishing quickly was not, as one might think, pleasure of knitting, or joy at the sight of so much lace emerging from my needles. There were certainly elements of both - but no, I'd have to say that what motivated this finishing spree was sheer, unadulterated terror. Right around halfway through the edging, I started thinking that maybe I'd be a little tight on yarn. 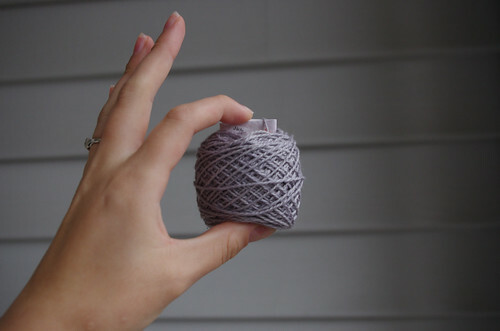 With each repeat, the teeny little ball of yarn got teenier, and I started having daydreams in which I got to the last five rows of pattern and was greeted by the last inch of yarn, mocking me and all my hard work and beading. I tried not to madly scheme my plan of attack, should this tragedy come to pass. 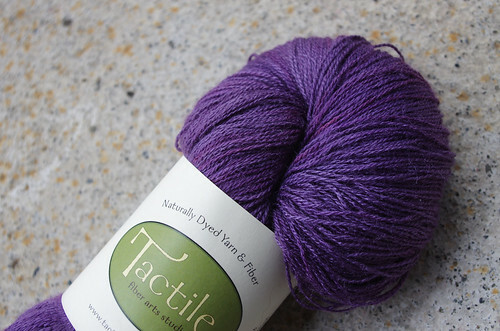 If it were, there would be more than a few roadblocks in my way: first, I bought this yarn so long ago that there's no way the shop still has any. 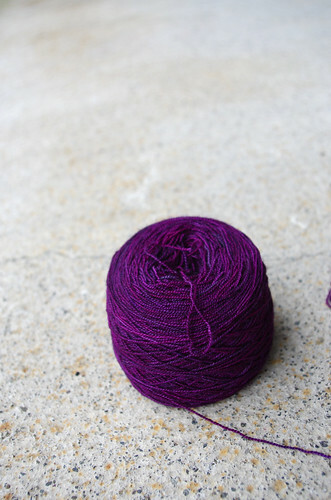 Second, I've found Jade Sapphire to have wildly different dye lots of the same colorways, so probably no ordering new yarn to finish - not to mention the rather hefty pricetag of an extra skein of yarn just to finish two inches or so of fabric. Luckily, as you can see, I did make it. Right about halfway through the very last repeat, I realized that I would definitely have enough yarn, but by that time, it seemed a shame not to finish the thing. And finish I did: in the wee hours of Sunday morning, I cast off the very last stitch and unceremoniously dumped the shawl in my blocking basket. And people think I do this for fun. 1. 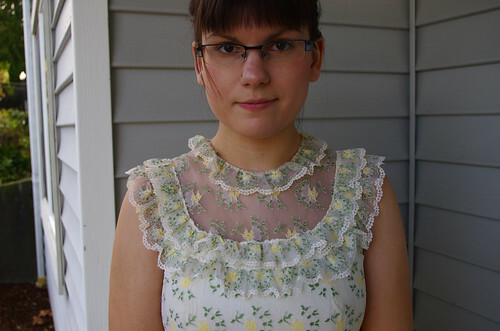 The high, frilly collar. Although I had been thinking about cutting off the lace panel at the neck entirely, I reevaluated that plan after taking a closer look at the construction. That lace panel is actually a continuation of the lace on the bodice, and there is another stabilizing layer of white tulle underneath. If I were to remove both, I would need to leave a seam allowance and either bind the edges with bias tape and sew it down or do some sort of other hem binding or facing. 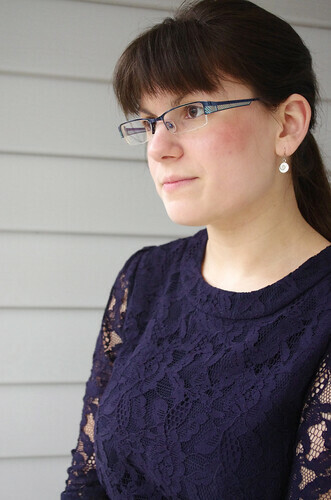 So, instead, I opted to pull off the ruffle at the neckline. It keeps the whole high-necked Victorian feel, but feels a little less over-the-top. There is a little extra fabric previously kept in place by the stitching that held the ruffle on, so I'll need to tack that down, but that's a pretty easy fix. The only other potential issue here is that the neckline is still pretty tight. I'll have to figure out whether there's a way to change it, or if I'll just have to live with it. 2. The too-long, scungey hemline. I tried the dress on a few times, measured and pinned up the excess to the inside of the skirt, and played with the length until I settled on just about tea-length. I had Lumberjack help by marking my desired hem length with a pin, since anyone who has ever tried to mark lengths while wearing the garment will know that it's a total pain. 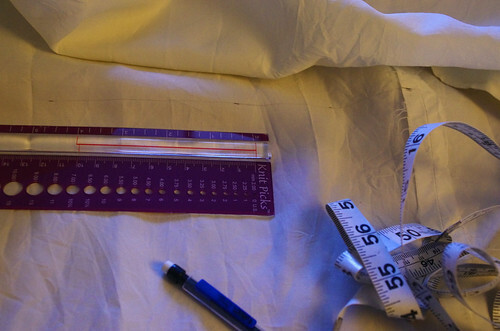 After settling on moving the hem up by about 13 5/8 inches, I subtracted a quarter-inch turn and an 1 1/4 inch plain hem to get a cutting line of 12 1/8 inches above the bottom hem. I measured and marked all the way around, then connected the lines with pencil. 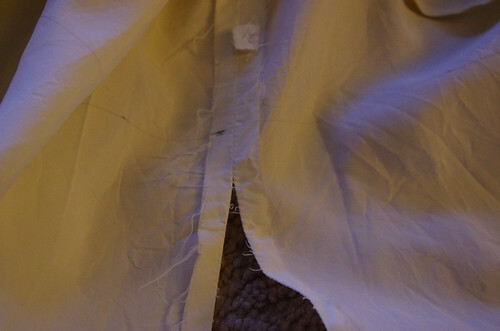 I ripped out the back seam up to my cutting line, then cut on the line all the way around. (As a side note, this fabric is hilarious: it feels like raincoat fabric, and goes shick shick shick as you cut, way more like plastic than fabric!) It removed the gross part of the hem, and the length now looks a lot more proportional to the top of the dress. I still need to sew the hem, then deal with the lace. 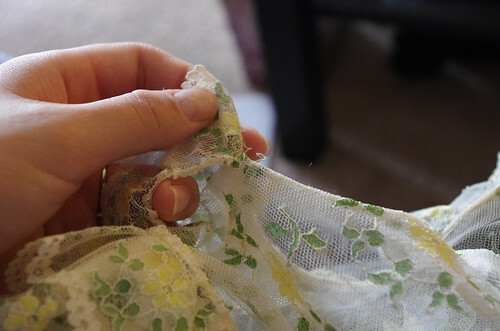 I haven't decided yet how I'm going to treat the lace - it currently has a twisty, messed up horsehair braid at the hem. I don't know if I'll try to replace the horsehair or just do another plain hem. 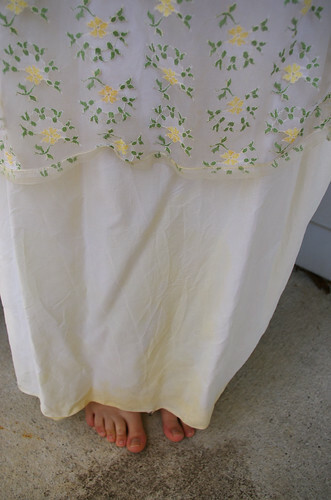 On a side note, I think this dress was actually commercially made and not home-sewn: when I was fumbling around trying to pin up the hem in those yards and yards of fabric, I found a little tag, which you can see at the top of the last photo. It's marked a size 13 but doesn't really have any other information. There goes my theory! Oh well - it's still a cute little dress. It still needs quite a bit more work, but hopefully I'll have more to share soon! I cast on for Serab in some Sundara Sock last Thursday night in preparation for a trip to Ellensburg to visit one of my friends at school, since socks make great travel knitting. 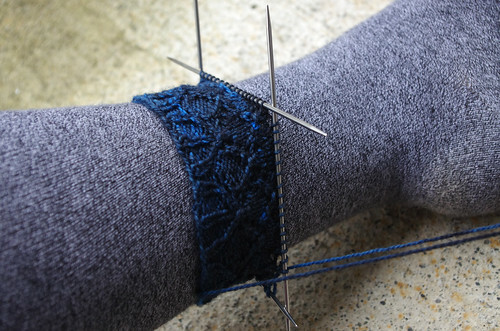 Things did not go quite as planned, though: I knit about an inch and a half of sock and got stuck. More and more often, I cast on for a sock and it fits, but it doesn't fit quite well enough, and that's what happened here. So I don't want to continue knitting just to find that the sock is way too big, but I also don't want to rip it out quite yet. It's a conundrum. It fits over tights with room to spare, but I usually only wear socks over tights when it's really cold. 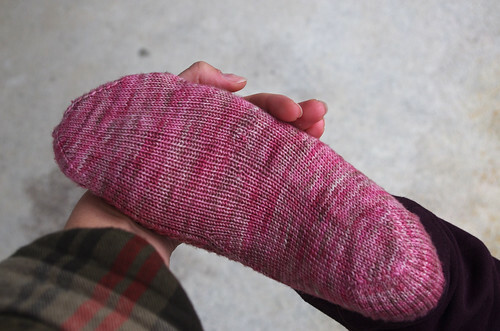 I'm not sure if it's so big that it will fall down, but it definitely doesn't have that lovely blocked-by-the-foot look that happens when a sock has just the right amount of negative ease. 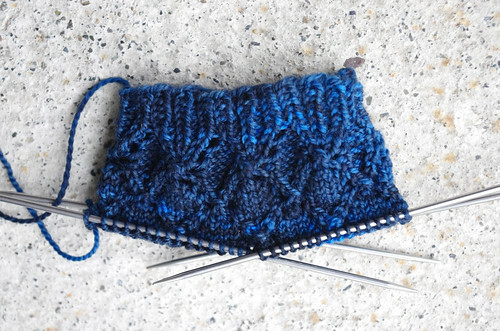 I'm not the biggest fan of the way the yarn is pooling at this stitch count, either - I didn't think it was possible for a semisolid to pool, but it has, in little patches of lighter blue on the deep blue. The yarn itself is lovely to work with, though, and I'm sad that this particular yarn base isn't currently available through Sundara's website. I'm sure that a few weeks will bring me some clarity on whether to keep going or rip this sucker out. In the meantime, I'm probably going to keep on trying it on, wrinkling my nose, knitting a few rows, rinsing and repeating. So I've been a little laggy on posting this week, but I have a totally good reason why: I had a fashion job/internship interview today! So Tuesday and yesterday were spent getting my resume and samples in order, and today I had the interview. It went well, and I'm really excited to start! So in the meantime, here's some eye candy. This is a yarn called Verve, by the Unique Sheep, and I picked it up over Christmas on the Washington coast. That electric purple was what really grabbed me - I'm a total sucker for jewel tones. I'm thinking that I want to use it for something pretty simple, to showcase the color changes. 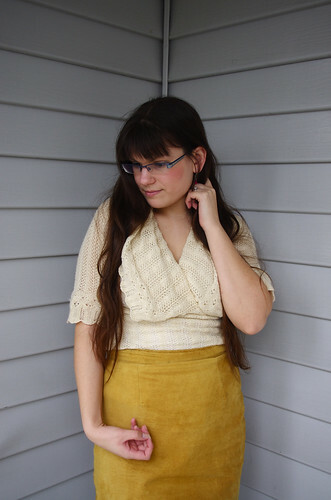 I gave my original Multnomah to Smith's in Oberlin as a shop sample when I left, but I did really enjoy making it. It might be time for another! Alright, now it's time to kick off my heels (literally), eat some leftover Korean food for dinner, and do a couple of rows on Harbour Lights. Hope everybody is having a great week! I've been in a major style rut lately. All I ever seem to want to wear is jeans and t-shirts or oversized sweaters - not that that's a bad thing! - but I remember those days at Oberlin when I'd wear heels and a crazy outfit to work at the student union, and I sigh. Where has my panache gone? My desire to wear kickass high-heeled boots while setting up tables, high-waisted skirts and tailored jackets to coffee dates? And then I realized that I hadn't gone thrifting in something like five months. Egads - no wonder! For some reason, looking at old clothes inspires me to go home and try things on, to make color combinations I wouldn't ordinarily think of, and to gather up my courage to wear looks that border on costumey. So yesterday I went on a Magical Mystery Roadtrip to Issaquah to one of my favorite vintage and consignment shops. I poked around in the racks for a bit and took five things with me to the dressing room. Then the unthinkable happened: I liked all of them. Every single one either fit perfectly, or had some great design detail, or was a great color. I bought all of them - four dresses and one cashmere sweater - for less than I've paid for a pair of pants. And I was inspired to dress up this morning. In clothes that I already had in my closet. I think at least part of my lack of recent vintage shopping/thrifting is because my absolute favorite haunts are back in Ohio. In Seattle, some of the areas with the highest volume of thrift shops are also the most picked over, so I have a really hard time finding anything I like. Issaquah, about 20 miles out in the suburbs of Seattle, is actually fast becoming my favorite place to look for old stuff - there's a high end vintage boutique called Stella, the vintage/consignment shop I went to yesterday with mid-range prices called Doubletake, and an antiques mall full of books, beautiful old furniture, and various housewares. It's funny how sifting through a huge variety of things can make you think differently about what you already own. The funniest part of my outfit today is that only item I bought new was the shoes. The rest have been in my closet for six months to five years. I guess everything old really can be new again.